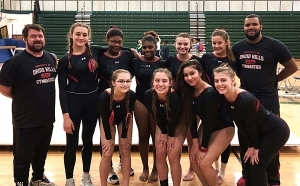 It has been some 30 years since Druid Hills competed in gymnastics, but the Lady Red Devils made a triumphant return by knocking off two-time defending champion Lakeside 98.90 to 92.80 to claim the program’s first ever DeKalb County Gymnastics title at Dunwoody just before Spring Break. Druid Hills’ lone gold medal before this year came back in 1974 when Nancy Davis tied Lakeside’s Denise Finney for the gold in the uneven parallel bars. Junior Amelia Wainscott and her teammates made sure Druid Hills was on the map in DeKalb County as Wainscott won four gold medals and Olivia Ewing won a gold and added a pair of silver medals in the county competition. Wainscott won the uneven parallel bars over last year’s reigning champ Amelia Stockwell of Lakeside with an 8.600 to an 8.500 and then scored the highest total of the meet with a 9.00 to win gold in the balance beam. 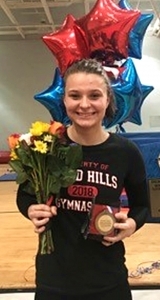 Druid Hills’ junior Amelia Wainscott wins the 2018 DCSD County Gymnastics All-Around title. She tied teammate senior Olivia Ewing with a score of 8.800 for the gold in the floor exercise and won the county all-around with a total of 35.100. Druid Hills’ sophomore Annie Blount finished fifth in the All-Around with a total of 30.700 giving the Red Devils three of the Top 5 point totals. Blount’s highest finish was a tie for fourth in the floor exercise (7.900) with Southwest DeKalb’s junior Chayce Sanders. Last year’s All-Around champion junior Amelia Stockwell of Lakeside finished third with 31.800 points, including a silver medal on the uneven parallel bars (8.500). Stephenson’s sophomore Aeriel Walker was fourth in the All-Around with a 31.000 total on the day. Walker’s top finish was fourth in the balance beam (8.300). Wainscott qualified in the All-Around for the state meet and put up a score of 9.125 on the floor exercise which was .325 better than her score in the floor (8.800) at the DCSD Championships. Unfortunately she suffered an injury to keep her out of the All-Around competition. Druid Hills won all four of its meets against DeKalb County to go 4-0 and the only regular season meet loss came in a meet involving Etowah in which the Red Devils lost by just two points to the visiting team. Wainscott had four All-Around titles, not including the County Championships, on the season including the meet against Etowah. Ewing had a pair of second and a pair of third place finishes in the All-Around competition during the regular season. Kay Rumsey finished fourth three times in All-Around competition during the season with one third place and one sixth place. Annie Blount picked up a silver medal in one of the county competitions.